The ANWB (Royal Dutch Touring Club) is the largest travelers’ association in the Netherlands. In 2012 the ANWB introduced their first app, ANWB Onderweg, but 5 years later the app was still far from perfect. During my studies at the Amsterdam University of Applied Sciences I conducted UX research to find out on what points the app could be improved and came up with suggestions to make the app better. The ANWB introduced the ANWB Onderweg app back in 2012, meant as an extra service for its 4.5 million members. With the app users can, among other things, get the fastest route to their destination, find parking spots and gas stations and get notifications when there is a traffic jam on their route. The ANWB is the largest travelers’ association in the Netherlands, founded in 1883. However, even after a complete redesign in 2017, the app was still far from perfect and received mostly negative reviews. The challenge was to get a good overview of the stumbling blocks for users and to come up with useful suggestions to improve the app based on those results. A review by Dutch blog iCulture of the app redesign that was introduced in 2017. During the analysis phase I conducted a user trip, as well as a content audit, and created a sitemap to get a good overview of the structure of the app. My key insight during this phase was that the navigation in the app was quite difficult to use; in order to go to a different section in the app, users had to go back to the start screen and use the menu there. On top of that the structure of the app was overly complex which made navigating through the app even more difficult. In the research phase of the project I conducted an expert review, gathered feedback from users of the app, created a User Requirement List and came with suggestions to improve the sitemap. The structure of the app after its first assessment with ● blue being components that could be merged into an other section, and ● red being components that could be removed. An interesting insight was that the app was quite difficult to use while in a car (for example when the phone was attached to a car kit) because the tap areas in the app were extremely small. Using the app while the phone was connected to a car kit was extremely frustrating because it wasn’t easy to tap on the right button. My proposal for the new structure of the app. Introduce a toolbar (see apps like Instagram or Spotify) so users can easily navigate between the different sections in the app. This would solve the issue of having to go back to the homescreen in order to navigate through the app. Restructure the app and merge/remove sections. This will make the app clearer and easier to use, especially with a toolbar. Make one view which shows all core functionalities of the app at once – for example in ‘driving mode’. Users can see their route, nearby gas stations, available parking spots, etc. in one view and don’t have to constantly switch between different sections in the app, which is especially annoying while driving. Improve the rest of the design so the tap areas are bigger. Old (left) vs. new (right): with a new structure, larger buttons and more focus on the primary sections of the app, the app is clearer and easier to use. Although the ANWB Onderweg app had the potential to become a must-have app for all Dutch motorists, it lacked a final touch that would convince potential users to download (and keep) the app. 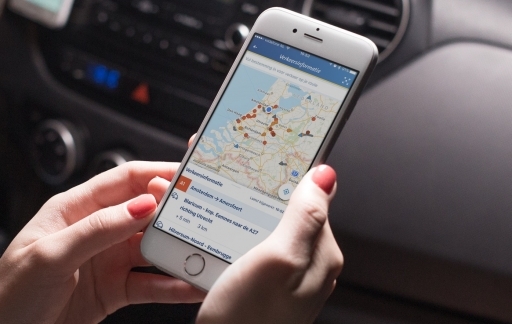 With the proposed changes the app can definitely become an indispensable tool that will be a resource for millions of motorists in the Netherlands.